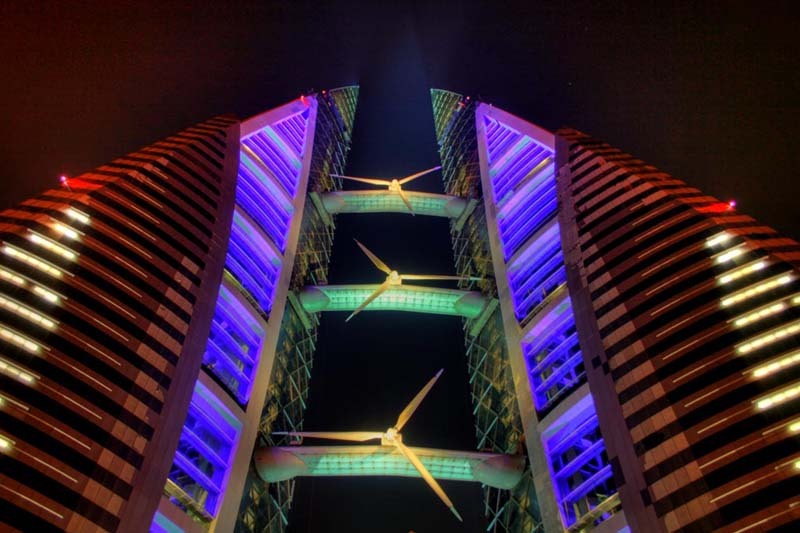 The Bahrain World Trade Center integrates large-scale wind turbines into its design; and together with numerous energy reducing and recovery systems, this development shows an unequivocal commitment to raising global awareness for sustainable design. This building is pioneering a new direction for designers and owners acting as a technological precedent. The BWTC has shown that commercial developments can be created with a strong environmental agenda and addresses the needs of our future generations. The BWTC encapsulates the essence of a sustainable philosophy engaging all of the social, economic and environmental impacts of the project. 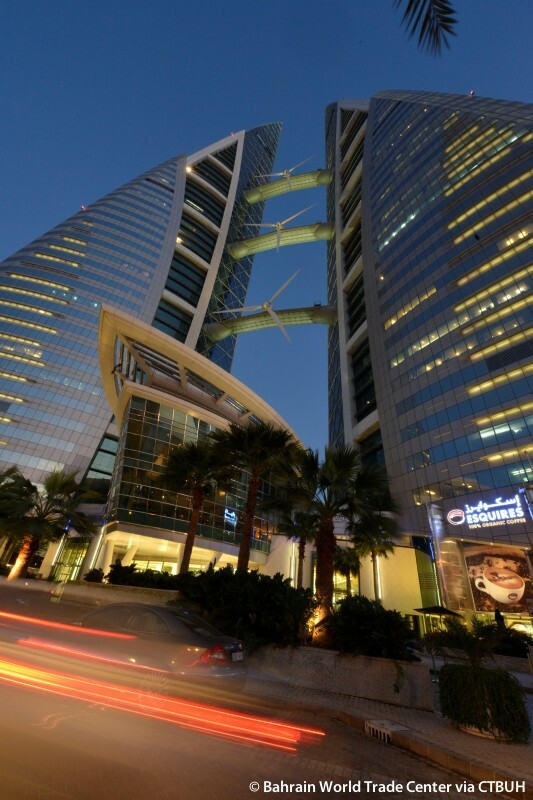 As well as making significant strides in environmentally balanced architecture, the building is now considered a source of national pride for Bahrain residents, and is attributed with generating economic prosperity within the capital of Manama. The BWTC forms the focal point of a master plan to rejuvenate the 30-year-old existing hotel and shopping mall on the site. The planning of the site became constrained by the existing buildings and the road network around the site. By extending the main axis of the existing shopping mall towards the sea and creating a secondary axis from the Hotel, “Retail Streets” were established. 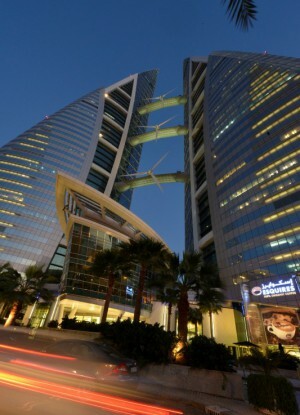 The twin towers’ natural location was therefore positioned on the main axis, facing the Arabian Gulf and creating the entrance for the development. The inspiration for the twin towers originated from regional “Wind Towers” and their ability to funnel wind, and the vast sails of the traditional Arabian Dhow as they harness the breeze in driving them forward. After careful Computational Fluid Dynamics (CFD) modeling and extensive wind tunnel testing, the towers’ shape was literally carved out by the wind to create optimum airflow around the buildings. The elliptical plan forms act as aerofoils (see plans on page 91), funneling the onshore breeze between them, creating a negative pressure behind, thus accelerating wind velocity between the two towers. Vertically, the sculpting of the towers is also a function of airflow dynamics. As they taper skywards, the aerofoil sections reduce. This effect, combined with the increasing onshore wind velocity at higher altitudes creates a near equal regime of wind speed on each of the three turbines, irrespective of height, allowing them to rotate at the same speed and generate the same energy levels. The three 29-meter (95-foot)-diameter, 11 ton wind turbines are supported on 31.5-meter (103-foot), 70 ton bridges between the towers. Each turbine generates 225kW. 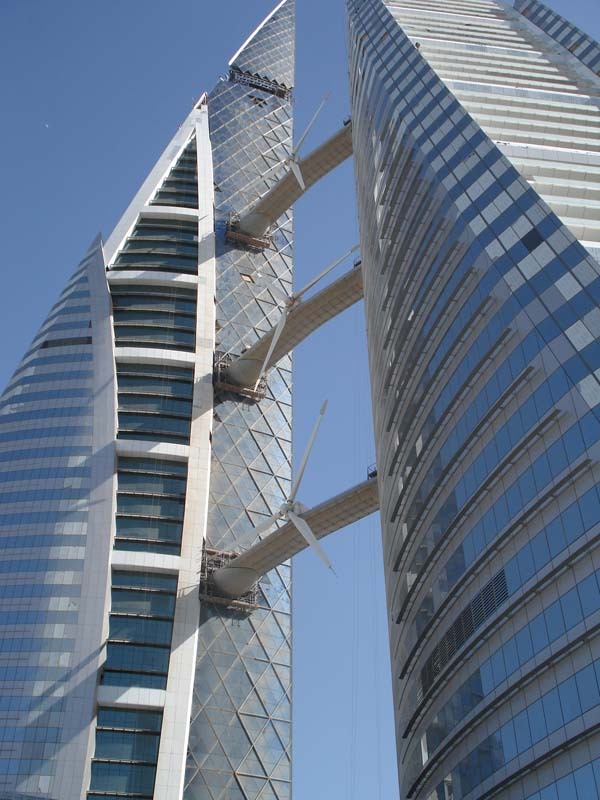 The buildings have been sculpted to funnel the uninterrupted on-shore breeze onto the turbines and create a perpendicular slip stream that corrects the wind direction to take advantage of 70% of Bahrain’s wind energy. The premium on this project for including the wind turbines was less than 3% of project value. Based on the energy savings and the increased value of the building having wind turbines, the payback period is extremely favorable. The initial energy yields during the design phase was approximately 15%, therefore 1300MWh per year; however, from early commissioning results the turbines are estimated to generate substantially more energy due to the reduced occupancy profile of the building and the wider operational period of the turbines.